I have seen many changes in the London Borough of Southwark, especially being brought up my whole life on a social housing estate along the Old Kent Road. I’ve seen all the comings and goings of such a diverse society. Three years ago, I took myself off to university and studied a Housing Degree. I can assure you it wasn’t easy, studying and being a mother to three small children at the same time, but I knew there was more I wanted to achieve and to give back to the community I came from. I was aware of how good my childhood in South Bermondsey was, with a sense of community spirit which in my opinion was starting to feel lost. A few months into my degree I started putting my skills into practise. I joined my local events committee as a volunteer at Avondale Community Events, located on the Avondale Square estate. I was asked by my estate manager to deliver one off events throughout the year, with the aim of bringing people together and being inclusive to all. 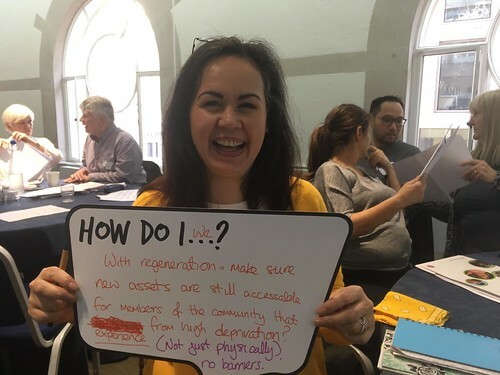 During this time, the community engagement manager of The Big Local South Bermondsey Partnership approached the Avondale Community Events committee, and explained what they hoped to achieve over a 10-year period in the area. This includes building and developing community engagement, and to leave a positive impact along the Old Kent Road by reaching out to six estates and the wider community. Well of course this was something we were all very much interested in. At this point I began to think about the area, and even though I have been up and down the Old Kent Road hundreds of thousands of times in my life, I actually didn’t know much about the wider communities and the people who live so closely to us. People who you probably see on a weekly shopping trip to the local superstore. About two years into being a volunteer and working closely with such a wonderful bunch of like-minded individuals, I applied my skills to assisting and advising people on matters relating in and out of work welfare benefits. This involves helping them better understand their entitlements and even going so far as to help them take cases to the appeal courts. It can be very daunting when you do not know how. Today there are more people in work claiming benefits and it is not an easy life, especially with the introduction of Universal Credit. People are feeling as though they are being pushed to breaking point. Never make or pass judgement on anyone, you really don’t know what’s in store for any of us in the future. People need help, and to feel empowered enough to understand the process. Southwark has high levels of deprivation and since 2010 most of us have felt the strain of cuts to services, especially combined with the rising cost of living. That is why, with support from The Big Local South Bermondsey Partnership, I have been fortunate enough to gain employment deliver a Job Club to support residents. We help with online job searches, form filling and benefit related appeals. They are people who perhaps like myself, many years ago, did not know who to turn to for guidance and who just need a helping hand. Changes will always take place, even if we want them or not, but as a community we can make the most of changes and help to empower one another. For a brighter and more hopeful future.